Earlier in the week, I talked about some ideas on styling the top of my China Cabinet here in the Dining Room. So I thought today I would just continue with more pics of my teensy Dining Room/Area. I'm grateful for a Dining Space, but it's on the smallish side, with only 3 walls, and I have largish furniture. Because this room is smallish, it's hard to get good photos, so I end up moving chairs around and working on an angle, just to get some distance. I like my Dining Room furniture so much better here at the new house. (I continuously had a battle with myself and my desire to paint it all out in a white or greige) I think it may be the color of the walls here and the height of the ceiling. Even though I have less space it's visually more pleasing than before. I found my antique Triptych mirror and just leaned it up against the wall. It looks a little busy, so the jury is still out on that one. I moved my little Porcelain Girl from the table and it balances out the cloche on the other side of the large ironstone tureen and platter. so I'm looking forward to doing something with it for Fall. but there again, I'll do it up for Fall. Sorry, this reflection makes it all look really cluttered. You all remember this post where I had an epiphany on table runners? I've just been buying fabric yardage and then tucking in the extra on the chairs at each end. I hate to sew, and this is the lazy gal's version of a table runner. This way if I want to use it for pillows later I can. Anyhoo, that's my story and I'm sticking with it. I love this wonderful red/coral color in the background of the fabric. It's Waverly, and I have kitchen curtains in the Brown background fabric. This time of year, as Summer is winding down, I love to bring out the deeper, richer colors to accessorize with. It's an easy transition into Early Fall. then I'll put darker Hydrangeas in, when it's closer to Fall. out what I want to do for Fall decorating. I have a few boxes in the basement calling my name. Have big plans this weekend? 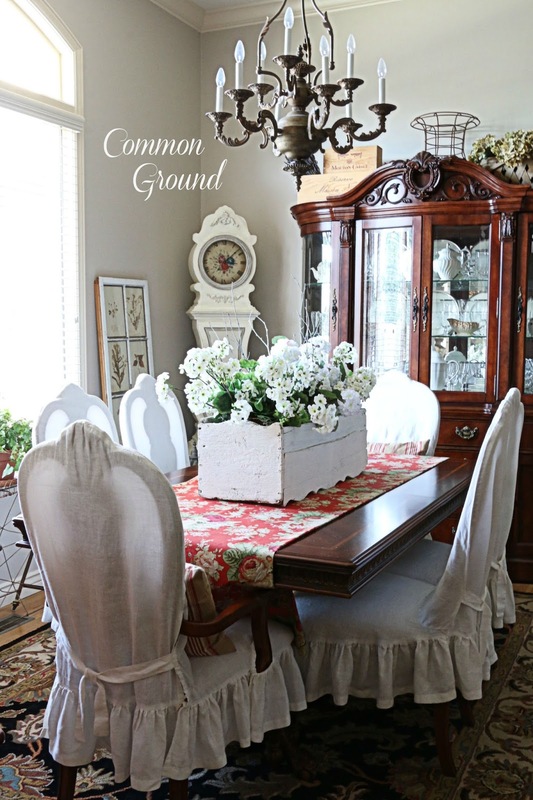 Love your dining-room. Debra. It's so beautiful. It looks beautiful! It's funny...so many of the bloggers I read love fall the best. Me too! Your furniture is really beautiful, Debra. I really love painted furniture but would never paint anything this wonderful. Your styling in your dining room is charming. The room looks wonderful! Have a great weekend! Your dining room is beautiful, Debra. 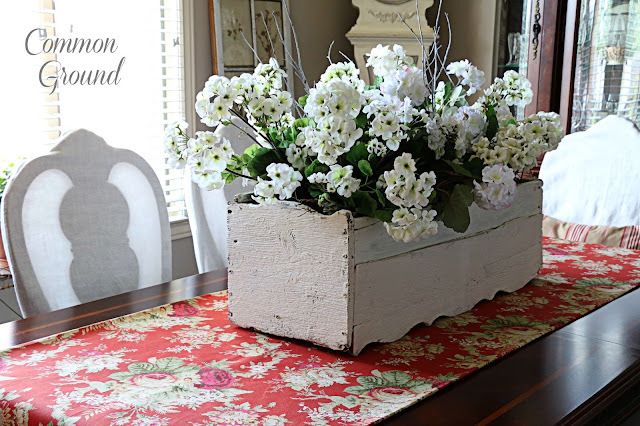 I had forgotten your table runner trick and I have to say I love it!! 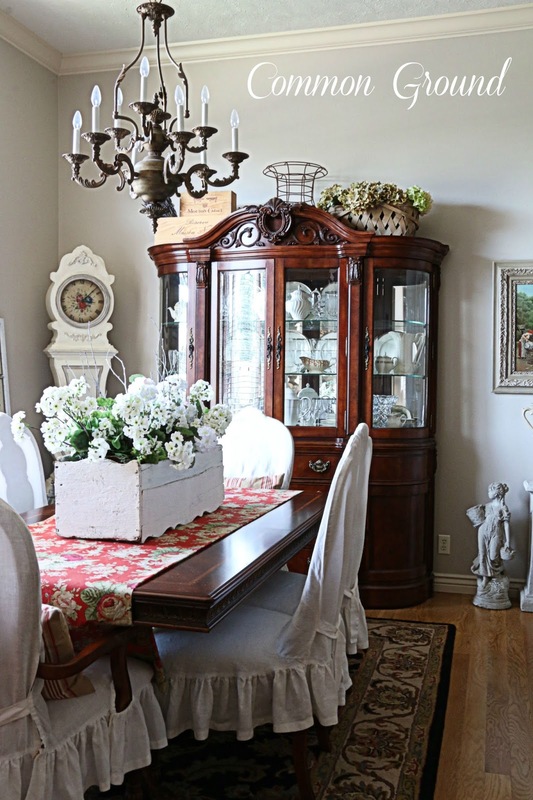 Love your dining room, even though it is smaller.....it has those wonderful tall ceilings and that makes a difference. The furniture pieces are outstanding, do not paint them!!! 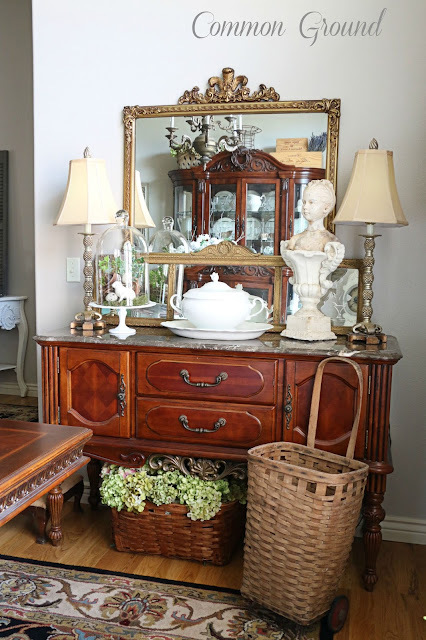 You styled the china cabinet so nicely.......I am never happy with my cabinet, can't get it right except at Christmas time.....it looks good then!! It's the size of the center of your cabinet with a broken pediment at the top. And very difficult to get it styled right....... Can't wait for Fall!!! Your small Dining Room is large on style, dear friend!!! I adore the vignette on your buffet!!! 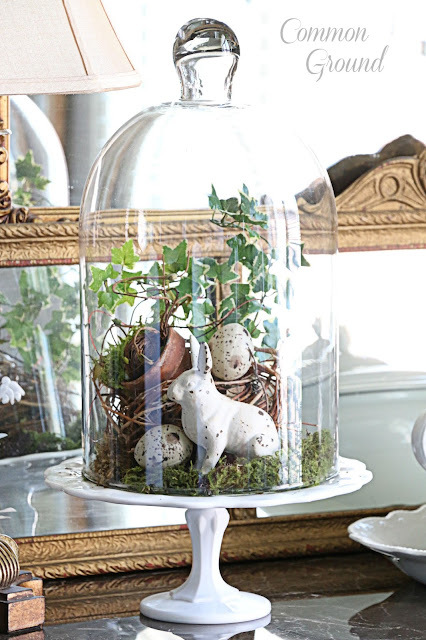 I'm smiling. . .just yesterday I noticed I still had my Spring decor in my cloche, too!!! I smile. . .because it, too, may "wait" for an Autumnal creation!!! or properly fitting tablecloths and runners here, either!!! Resources are pulled, lists are being made. . .and I have "Mr. Ed"
heading to the garage workshop early next week. I'd say Autumnal Decor will be arriving, soon, dear one!!! 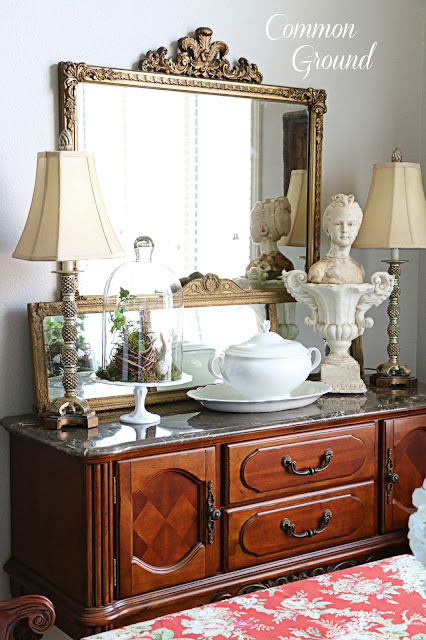 I love the mirror you have propped sideways on your buffet! I have a smaller one that I use in the center of my larger vintage mirror. It adds another dimension and makes everything more interesting and I can take photos without my big ole head in the mirror! Love the red fabric on your table, I must confess I am no sewer either. 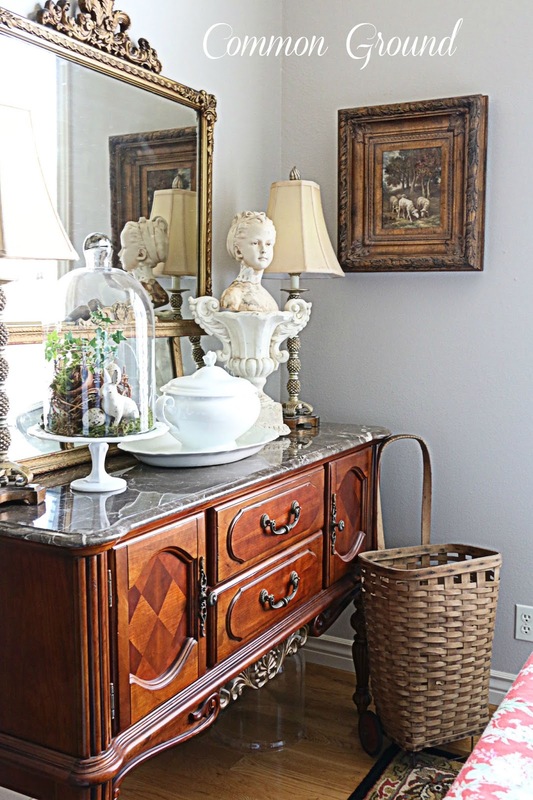 That furniture is so, so pretty, and the mirror it too! 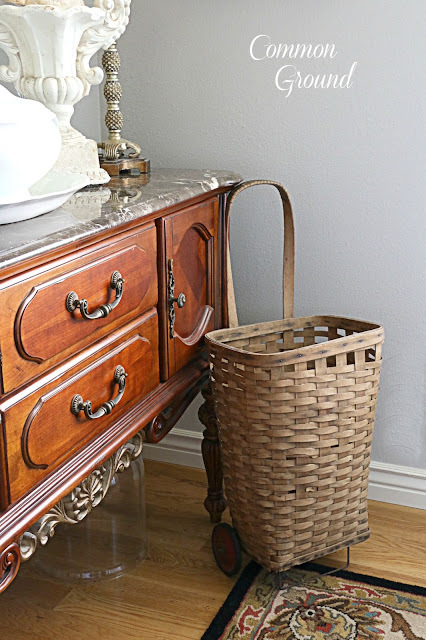 I'm always excited to see others who don't paint every piece of furniture! I have some I've painted and some I've left with original finish....I think it adds depth to a room and the old patina is just so gorgeous! I do add paper to the back with double sided tape if I feel it helps my accessories stand out more. I have a China cabinet from my hubby's great grandparents and a barrister bookcase from his mom that I added bead board wall paper to that I think brightens the look of the dark finishes. I love how you decorate. Thank you for all the inspiration! 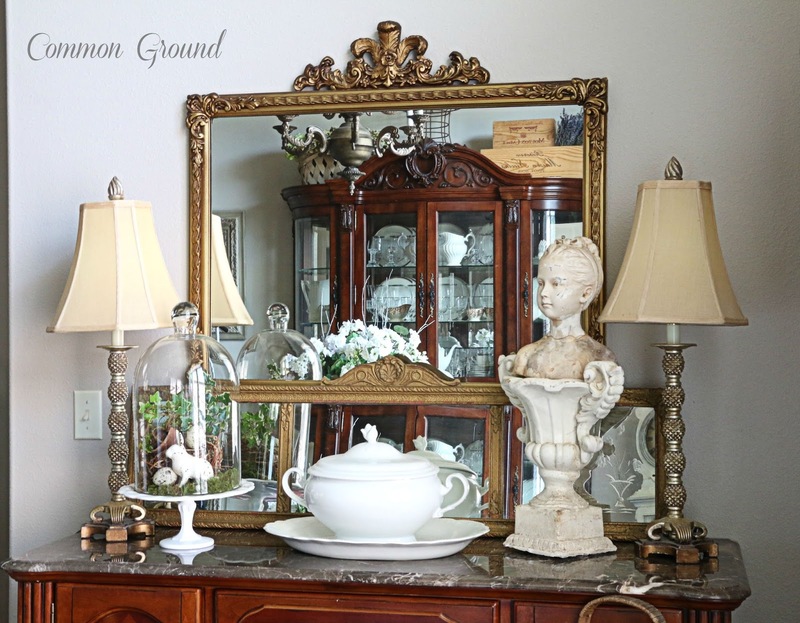 Beautiful décor and wonderful pieces. 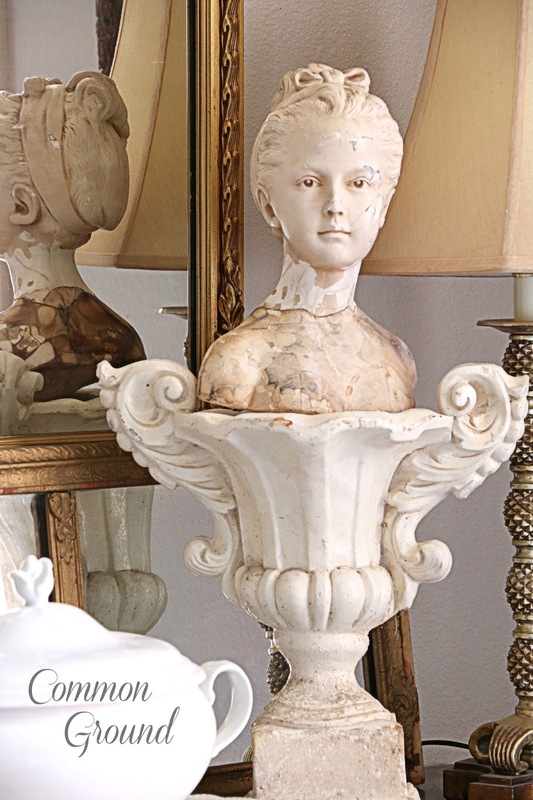 The bust of the young girl is awesome! Can't wait to see what you do for FALL! I adore your window box and your market basket. I too, can't wait to see what you do for fall. Gorgeous! Such a beautiful space filled with so many special touches! Hi Debra. 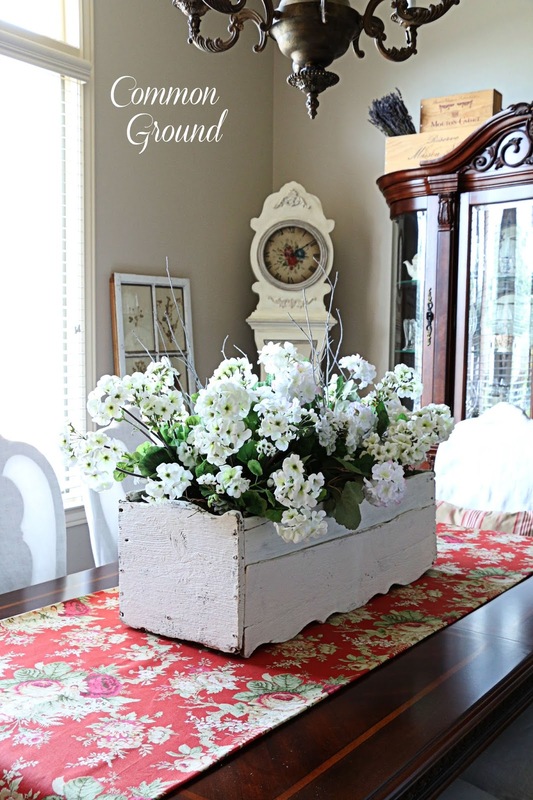 I think your buffet and your whole dining room are so pretty! I'll be featuring it this Monday night at The Scoop. Thank you for linking up! You say your dining room is small, I don't know, but it seems to me every and each of your gorgeous pieces of furniture fit perfectly! I love how you decorated your buffet. 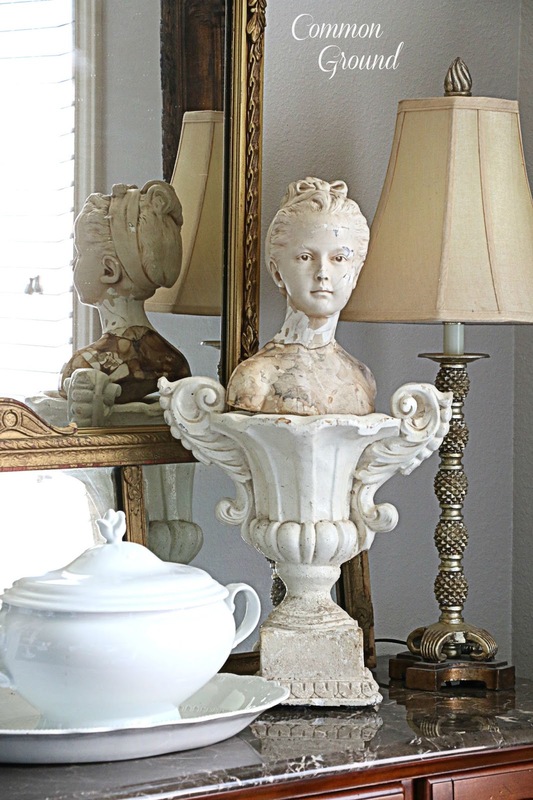 The tureen and the girl's bust is gorgeous and I do love the two mirror ideas. I can't wait to décor and see yours for Fall for inspiration.